ABOARD DELTA FLIGHT 9771 FROM ATLANTA — Passengers wrote on the cabin walls. There was free champagne for all onboard. And there was a wedding in economy class. Delta Flight 9771 was anything but ordinary, and that was by design. The Wednesday flight from the world’s busiest airport in Atlanta to a remote salvage yard in southern Arizona marked the last time that Boeing’s 747 jumbo jet would fly for a U.S. passenger airline. United retired its last 747 in November, leaving only Delta. Some foreign airlines — including British Airways, Lufthansa and Korean Air — still use the 747 for passenger flights, though numbers of the aircraft flying non-cargo flights are on the decline. In the U.S., Delta operated its final regularly scheduled flight on the jet in mid-December. The 747 lingered on at Delta for two more weeks, flying charters — mostly for college and pro sports teams. That era officially closed this week. Delta flew its last 747 charter flight on Tuesday (Jan. 2), bringing the Clemson University football team home to South Carolina following the 2018 Sugar Bowl game in New Orleans. With that, there was only one mission left for Delta’s last remaining 747: a flight to the “boneyard” — a salvage facility where retiring planes are sent to be stored or scrapped. That was the mission for Delta’s unusual Flight 9771 Wednesday, when the airline sent its 376-seat jumbo jet on one last flight. On board were just 48 people, a combination of the flight crew, media and other Delta employees and family members with ties to the 747. During the flight, passengers used permanent markers to write farewell messages on the plane’s seats and cabin walls. “No, never!,” he exclaimed when asked if he had ever written on the inside of an airplane before. He let loose with a laugh, adding that such a move might be grounds for termination on a normal flight. On this particular plane, however, Vetter had a lot of company. Even before the retirement flight took off from Atlanta, its interior already bore graffiti from several previous sports charter flights. Delta spokesman Anthony Black said passengers on those flights were told of the plane’s impending retirement and were encouraged to leave their own farewell messages on the side of the plane. 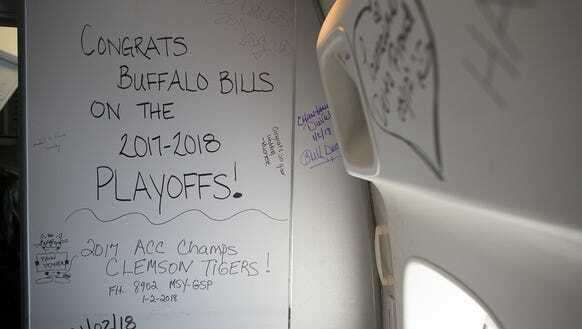 The Clemson football team appeared to be the most prolific of the message-leavers, though the plane’s unique graffiti also suggested the presence of the Buffalo Bills NFL team and an untold number of Delta employees. The in-flight ceremony joined Delta 747 flight attendant Holly Rick and Delta 747 pilot Gene Peterson, who fittingly met nine years ago while working on 747 military charter flight in the Middle East. The couple considered several spots for their wedding, but ultimately chose the so-called “Queen of the Skies” for their ceremony. Aisles in Delta’s economy section were gussied up with white lace bunting and rose petals in the aisle. The bulkhead separating Delta’s Economy Comfort seating from business class doubled as a backstop for the altar. For Delta flight attendant Chris Fincher, Flight 9771 was both a first and a farewell. Fincher, 32, said he had never flown on the jet prior to Wednesday, despite working for Delta for about 3 ½ years. “It’s unbelievable,” the West Virginia native added about finally making it onto the 747, saying the plane had lived up to its billing. On the 747’s upper deck, another Delta flight attendant stood, taking in the moment with friends and co-workers. Unlike Fincher, Nancy Cobb said she’s been on the 747 before. Many times. Somehow, she says, she ended up working the 747 on her first-ever flight for Northwest Orient back in 1985. The carrier — later Northwest Airlines — merged with Delta in 2008. “I’ve spent my whole life flying this plane,” said Cobb, now based in Detroit. Like nearly everyone else on the flight, Cobb said it was “bittersweet” to witness the end of the 747 era at Delta. But she said she also was determined to look ahead, noting that Delta’s new state-of-the-art Airbus A350s have already begun arriving to the carrier. But on Wednesday, there was one more day to savor the iconic 747. “She’s special to us,” Cobb said.